As you all know by know I love me some good accessories. And in winter I love that we can play around with hats. I have blogged about wearing hats in the spring to a polo fundraiser here and I blogged about a Dallas milliner here, and now I'm happy to share with you my latest loves in winter hats. There is not one style I love more over another. I actually think you need different kinds of hats depending on the occasion. A beret is cute to wear in more sophisticated outings. I like the beanie in colder days to make sure the ears are covered. And I love the broader rimmed hats for casual yet chic weekend running arounds. I would wear any of these in a second! 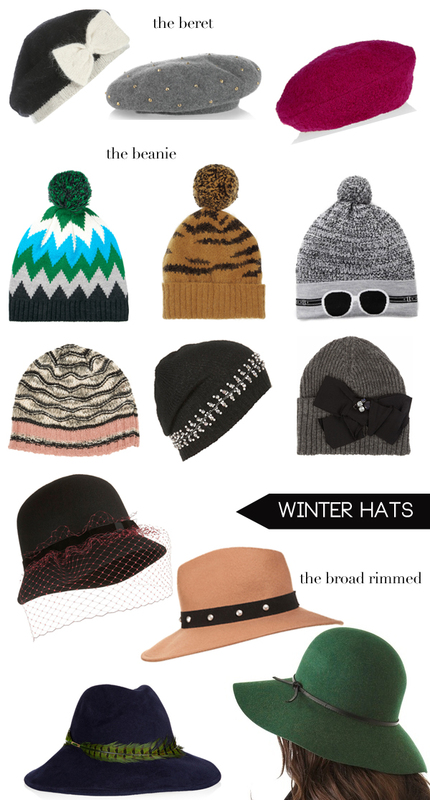 What kind of a hat girl are you? Ah lady, only you could make me miss winter! I miss wearing a fab peacock coat and an equally fab hat. A beret and a broad rimmed for me please. I love the broad rim options, especially that dark green hat, so pretty! I prefer the broad rimmed. but I cannot wear them so often because of the sunny weather here, in Malaga. Love any hats with bows! the first one is my fav! Love the hats and I have many in my wardrobe! I love them colorful especially in winter as we need color when it's cold to brighten our days! My fave are berets and beanies! These are just to good! all we need is a little winter weather now- these hats look like they would be such fun to wear! I don't think the directions are that difficult for the LA lights. You just need a handy friend to help since it seems like you'd need two people to hold things. I hope you really make your own! I LOVE that it is hat weather again! I just pulled out my hat box this past weekend! I want a cute beanie!! Can I pull off hats?!?! I don't think so. Might look like a re re!